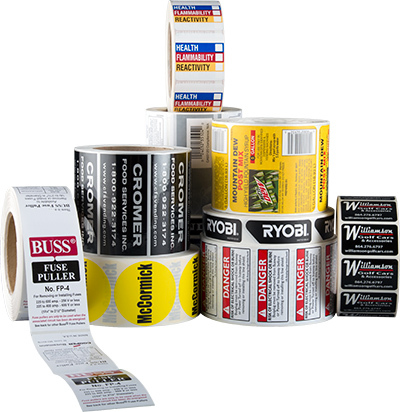 Brandmark, a Wise company, is an industrial label supplier providing unique label solutions designed specifically for the most demanding applications. We use robust materials and high performance adhesives combined with creative converting for product identification and tracking. Our extensive manufacturing capabilities and comprehensive knowledge of raw materials help you solve the most challenging label problems. Industrial labels help manufacturers to effectively track products along the entire supply chain. At Brandmark, our industrial labels can be designed to satisfy most any requirement, including machine-applied processes, unusual application surfaces, and various temperatures or weather conditions. Our labels adhere to anything from cardboard boxes and pallets to tires, power equipment, and chemical containers. We can finish your labels on rolls, in fan-folded packs, or in sheets. We produce the right label for you, from custom blanks for thermal transfer in-house printing to 4-color process with over-laminates and unique adhesives. I have excellent communication with the staff, I get answers quickly to questions and quotes, they have been thorough in processing my orders and questioning any unclear issues. Turnaround has been timely and when requested advanced if possible. Wise has a quality product, excellent customer service and competitive pricing. They just do a great job overall with very few problems. They are one of my favorite plants. You are one of the most professional factories that we work with. You always out-perform even our high expectations. In addition, everyone we deal with is a delight. They address our needs and our issues with effectiveness and might I say charm (lol). In short you guys are the best. Wise has always been very responsive to ours and our customers needs. They have done very good work for us and are very confident in their company.